I`m very happy to have finally finished my Unicorn. I wasnt sure if she was going to be a horse for a while but when I added her mane and tail fiber which I won from http://www.etsy.com/shop/riverstonealpaca, she looked so magical she had to be a unicorn. I`ve never worked with Alpaca fiber before and I have to say it is the most silky soft fiber I`ve even felt. Riverstone has been raising Suri Alpacas since 1999 in Ohio and sheers every April. They are gorgeous. Hillary's fiber was used in my Unicorn. It's not as easy to needle felt as wool but the results are dramatic and perfect for the look I wanted to achieve. This week I've been dreaming up all kinds of brooches. Here are a few I have finished and listed in my shop. I love Swedish Gala horses!. In fact I love all Scandinavian fold art and fabric designs. I plan of felting a series of 3d Gala horses in various colors. Dairy cows in green meadows, strawberry fields, sunshine, sweet summer breezes. These are the things that are inspiring me right now. Finally an adorable Viola brooch. I just had to show you how its coming along. This has to be my best piece of needle felting yet. Everyone in my house is crazy about strawberry season. We are just starting to see them in the shops again and it is heavenly. I have needle felted each strawberry from 100% merino wool. I didn't realize how time consuming making strawberries would be when I started this project. I started with a core of creamy white wool and then added the juiciest red color in my stash. The seeds are individually felted on next using the tiniest tufts of pale yellow wool. Finally the tops are cut out of 100% wool felt and I have needle felted color variation and the stalks. It seems so many things have been happening this week. Apart from getting ready for our big move my cat has had 5 kittens. It was big shock when we discovered she was pregnant as she is only 7 months old. All the kittens are all black or black and white so they are kind of hard to see in this photo. I have finally ventured into using wire frames for my needle felting. My first project was a rabbit which I am very pleased with. I am now working on a Unicorn which I am really enjoying. I have modeled it on a toy horse from my children's farm yard set. I still have more work to do but I am loving its shape. As you may already know I am a big fan of fabric covered beads. I have a few ones left from other projects and am thinking of new ways to use them. This one has a chain tassel that I think really sets it off. I thought I'd show you a pair of earrings I made just for me. I love Tibetan jewelry, especially the coral and turquoise pieces. I have used Turquoise in a sliver setting for these earrings and added Red Coral, Turquoise and Yellow opal chips. I love them. While experimenting with my fabric covered beads I discovered I could create a beautifully textured effect by adding cut out pieces from some old brocade anglaise style lace. I used Fabri-tac to adhere the pieces onto the beads. I think they make fabulous focal beads and it has opened up a lot of ideas to experiment with now. I really went for it and made 6 pairs of earrings on Sunday. I`m really pleased with the results. I had to show you this beautiful sweater I am working on at the moment. It is a shrunken pale grey cashmere sweater that will be perfect for a little girl. I am guessing 8-10 years, so a bit big for my daughter. I wanted to felt a Russian Doll design onto it like one of my dolls from my etsy shop. Girls clothing can be so much fun. I am very tempted to add a couple more dolls and maybe some flowers. I will be taking photos today to show you how I am felting the design on. It could make an awesome project if you have any wool sweaters that have shrunk and you would like to make something from them. Treasure Me: This brought a huge smile to my face: "I have been included in a few treasuries on etsy.com, but this one is one of my favorites by far. 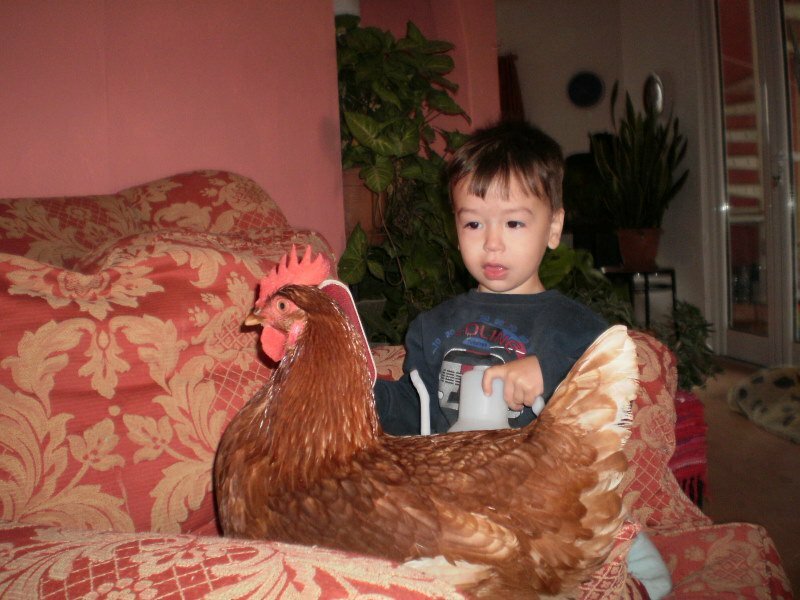 It's called Matryoshka Invasion and it is ..."
Treasure Me: Inspiration for Chicken and the egg: "I had to share this fabulous photo of one of my mothers chickens. They really make me laugh and are so smart. Not long after she got her 5..."
I had to share this fabulous photo of one of my mothers chickens. They really make me laugh and are so smart. Not long after she got her 5 Reds, they discovered they could go into the house through the cat flap. It's not uncommon to see one or 2 wondering around the living room before they are put back outside. We found this one happily making herself comfortable on the couch. Treasure Me: The chicken and the egg: "I have been wanting to felt a chicken for a while and finally got around to doing it. I`m super happy with her and have a feeling she`ll be ..."
Life gives you many surprises. I never thought I would have 3 beautiful children or my life would be touched by autism. It is a journey of discovery. Although there are some great challenges, my eyes have been opened to a different way of seeing things. The way things look and feel, what they sound like or smell like, make a much bigger impact to me than before. My love of making things began in childhood and when I had the choice of what to study for college Art and design was a natural choice. I love to experiment with different materials and I'm forever looking for my perfect medium. Needle felting is my latest craze. There is something about the feel of wool that is so therapeutic. Once I discovered needle felting I was hooked. The way you can manipulate the roving into all sorts of shapes, opens up so many possibilities that I am just beginning to explore.